Iraq’s defense minister said this week he considers Iran to be the country’s no.1 enemy. He claims Iran is taking over Iraq’s border positions and sending spies to infiltrate the new government, is it true? And how troubling is this? 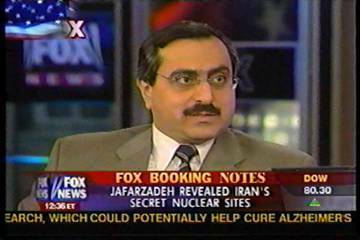 We‘re asking Fox foreign affair analyst, Alireza Jafarzadeh. He spent years uncovering Iran’s secrets. Always good to see you. Alireza Jafarzadeh: Thank you, Greg. Gregg Jarrett: Do you think it is true? Alireza Jafarzadeh: It certainly is true Greg. This is what I have been talking about for months. I think it is long overdue. It is good that Iraqi’s officials are showing the courage to talk about what Iran is doing. Iran has been using the past one year basically the past 16 months for sending their agents, arms, funding these groups, whether they were Iraqi nationals whom they had trained for many years in Iran. They had the Badr brigade which was created, funded and trained by the Iranian Revolutionary Guards, several thousand of them were send into Iraq, and then they had their own agents, Iranian agents who are all over Iraq and there were a number of agents caught with explosives near Baghdad and there were other agents caught in Kurdistan in Kelar and a number of them down south. Gregg Jarrett: And one was caught hundred mile down south of Baghdad, I want to quote if I can the response to that bit of news by the Iraqi Defense Minister, and I don’t understand this “we can send the death to Tehran’s streets, like they do to us, but we can’t do it if we are a democracy. But if my people say do it now, I will do it “. Now that is troubling what does it mean exactly? Gregg Jarrett: Like what? I have been there, they look rather helpless, I got to tell you. Gregg Jarrett: I kind of thought when I read that statement that he’s saying if you poison our people we are going to poison yours, and I immediately thought does this guy knows where the bio-chem weapons are stored? Probably not. Gregg Jarrett: A quick question, Moqtada Al-Sader: Is he in the pocket of Tehran? 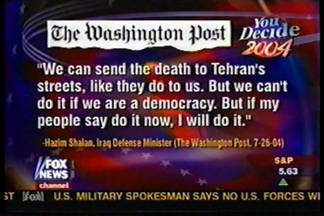 Alireza Jafarzadeh: Ok, let me put it to you this way. Tehran plays its cards in parallel, they have a number of groups including, you mention him but not limited to him, certainly the kind of violence that was going on around him helped Tehran to better consolidate its position, but they have a number of other groups, the Supreme Council for the Islamic Revolution of Iraq; they have Badr brigade; they have created new groups such as Hezbollah, the fifteenth Shaaban group, the Sayyed ol-Shohada group, they are funding them. On a monthly basis, they are paying salaries to them. Gregg Jarrett: Iran is still a state-sponsor of terrorism. Thanks to be with us, Alireza Jafarzadeh, good to see you. Alireza Jafarzadeh: Thank you Gregg, always a pleasure.